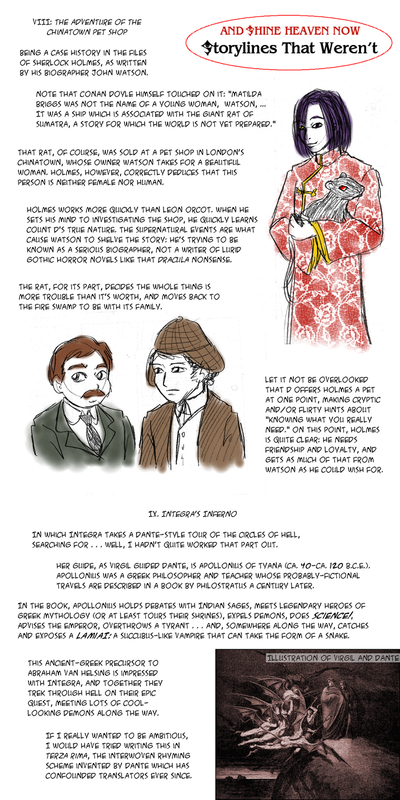 Being a case history in the files of Sherlock Holmes, as written by his biographer John Watson. That rat, of course, was sold at a pet shop in London’s Chinatown, whose owner Watson takes for a beautiful woman. Holmes, however, correctly deduces that the person is neither female nor human. Holmes works more quickly than Leon Orcot. When he sets his mind to investigating the shop, he quickly learns Count D’s true nature. The supernatural events are what cause Watson to shelve the story: he’s trying to be known as a serious biographer, not a writer of lurid gothic horror novels like that Dracula nonsense. The rat, for its part, decides the whole thing is more trouble than it’s worth, and moves back to the Fire Swamp to be with its family. Let it not be overlooked that D offers Holmes a pet at one point, making cryptic and/or flirty hints about “knowing what you really need.” On this point, Holmes is quite clear: he needs friendship and loyalty, and gets as much of that from Watson as he could wish for. In which Integra takes a Dante-style tour of the circles of Hell, searching for…well, I hadn’t quite worked that part out. Her guide, as Virgil guided Dante, is Apollonius of Tyana (ca. 40-ca. 12o BCE). Apollonius was a Greek philosopher and teacher whose probably-fictional travels are described in a book by Philostratus a century later. In the book, Apollonius holds debates with Indian sages, meets legendary heroes of Greek mythology (or at least tours their shrines), expels demons, does Science!, advises the emperor, overthrows a tyrant…and, somewhere along the way, catches and exposes a lamiai: a succubus-like vampire that can take the form of a snake. This ancient-Greek precursor to Abraham Van Helsing is impressed with Integra, and together they trek through Hell on their epic quest, meeting lots of cool-looking demons along the way. If I really wanted to be ambitious, I would have tried writing this in terza rima, the interwoven rhyming scheme invented by Dante which has confounded translators ever since.